Pretty Things: This is what thanks is all about. I about cried, and then laughed, and then about cried again. Cried because this little kidlet wrote what he felt, and the fact that he wants to make me earrings is about the darndest sweetest thing. I mean, what kid thinks of that??? And then I had to laugh because he didn't want to tell his older brothers that he wanted to make jewelry. Which is equally adorable. He'll prank them with plastic spiders in their beds, but he doesn't want them to know he has a sweet side. I'm thankful for a son like this. I've nurtured everything he's been interested in, whether it's been monster trucks, the solar system, or art. And I'll share a secret and hope I'm not blowing it by saying it, but Zack picked out a Bead Soup for the upcoming book. I hope I don't have to beg Kalmbach to keep that one in! His own box of beads, and he's already stringing. 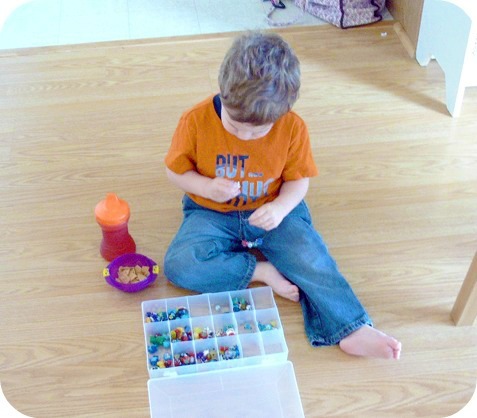 What's better than a sippy cup, a snack, and beads? Love you all, and Happy Thanksgiving. Oh, that's precious. He is a sweetie! He's so flipping adorable I can't stand it! A letter to treasure forever. So sweet. Happy Thanksgiving! So cute, so sweet, so heartfelt! You are a lucky lady. It doesn't get better than that! What a blessing. Happy Thanksgiving! How very thankful you must be for Zack and his father. The letter is precious and so is his photo you shared. Happy Thanksgiving...and making earrings. 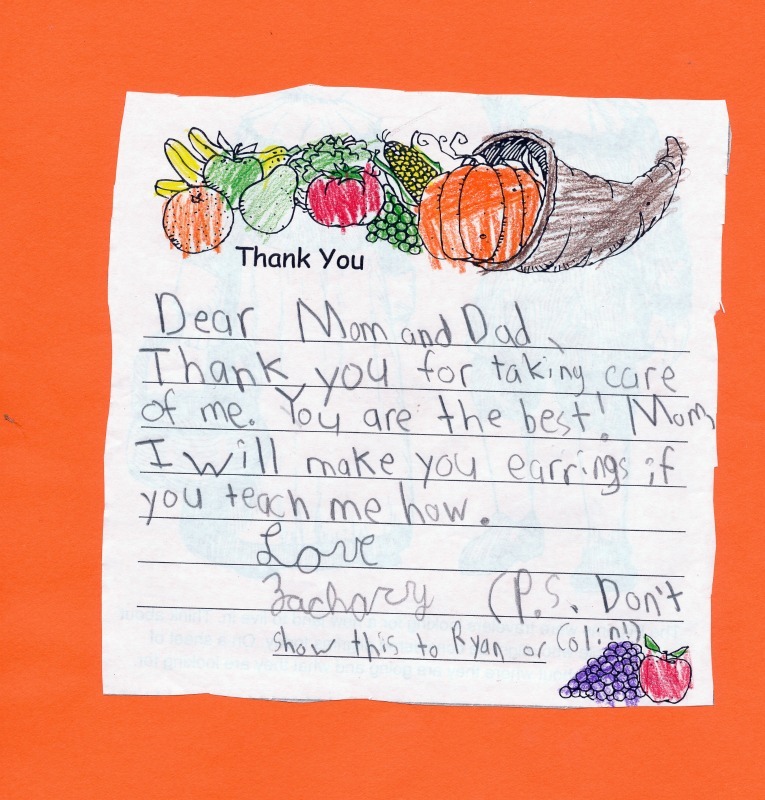 That sure is one sweet "I'm Thankful" note! Happy Thanksgiving to you and your family Lori! Have a wonderful Thanksgiving Day with your family. Love the post. We are thankful for you and your leadership with the Bead Soup. That is the sweetest letter! Definitely one to cherish forever. Thank you for sharing. Happy Thanksgiving! How wonderful to know Zac has a sweet, soft side. Even if he does hide it occasionally you'll always know it's there. Have a wonderful Thanksgiving. Forgot to add that I hope we get to see the earrings he makes for you. That's the sweetest! That's what it's all about!! How sweet, and how funny! I hope you and your family have a Blessed Thanksgiving! You just really can't beat that--present or at 3! Those kinds of occasions make for happy, grateful memories to be sure! Happy thanksgiving, Lori! Love you too, and your little guy is really, really precious! Lori dear, you have the sweetest boy of the world, you can be proud. Give him a hug from me ♥. I remember Zack has always been artistic. How wonderful he wants to present you with earrings I bet he will do it too what a great kid! Hope your thanksgiving is sensational. Adorable! I love kids spontaneity and openness about their feelings. Happy thanksgiving! Lori -this is so wonderful!! During the gem and mineral show this year my son purchased an amazing strand of pearls for me for Valentine's day. I have a Pearls Diploma from GIA and my husband told him 'You've got more guts than I do boy!" He did amazingly well - they're my absolute favorite! It seems they really do know us!! You have the cutest little guy..and so funny too. That's so sweet of Zack. Hope you all had a great Thanksgiving! Cuteness! Our little men make it ALL worthwhile!